Hokkaido has a vast area of arable land, and it dominates in the share of top-class production of many domestic agricultural products. However, weather fluctuation such as yearly differences in temperature are much larger compared to other warmer region. Therefore, damage to crops due to extreme cold that occurs at frequent intervals of several years is still a serious problem, and development of measures to mitigate this issue has remained an essential task. Moreover, damage to crops due to weather fluctuation has become more serious issue due to long-term climate change such as global warming, increase in amount of snowfall, decrease in soil freezing depth, extreme weather fluctuation etc. It also hinders the maintenance and management of the proper crop rotation system and greatly affects labor cost. Meanwhile, as an active adaptation to weather fluctuations, we are promoting the expansion and introduction of new cultivars. 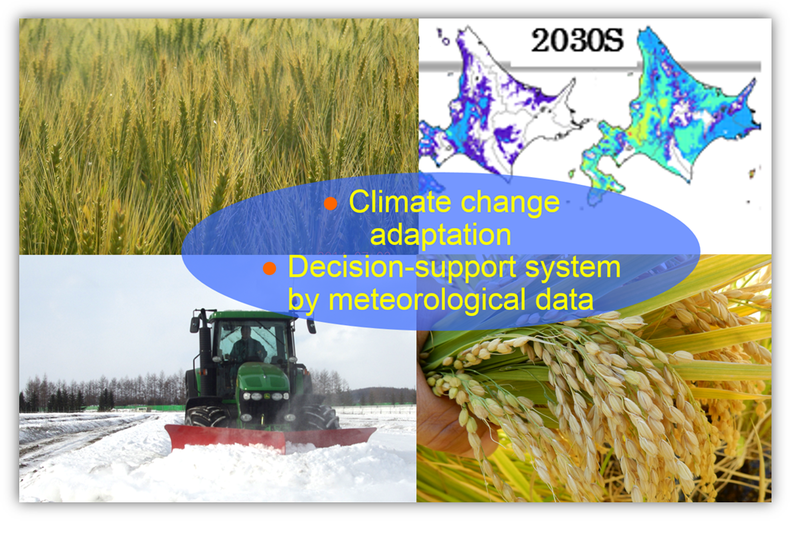 Therefore, we are pursuing research on the development of an information decision-support system to support judgment for agriculture corresponding to weather fluctuations in Hokkaido and for the development of technology to support the introduction and stable production of new crops. In order to contribute for the stable production under the weather fluctuations in the cold terrain, we are focusing in the development of technologies to enhance climate change adaptation measures related to paddy rice, field crops, grasses and new crops, and the development of countermeasures against these weather conditions.